Quinton Riley was one of our kids on the block so to speak. Just like Amos , Reggie , Thelma, Sporty, Lulabelle , and Cornie, unfortunately I could go on and on ,but you know what I mean. They were the kids that went to school together and the ones that competed in piggy sports together. They even were in piggy camp together and at special social events, they did therapy together and Fairs . They were the ones that taught us how to be good pig Moms and Dads. They were the last ones we tucked in at night and patted their heads and kissed their snooties. They were the first ones that demanded their breakfast in the morning as we were just opening our eyes. They were the ones that made us who we are today. They taught us to laugh out loud and cry when they hurt. They challenged us to reach for the sky. They taught us how to be proud to have a pig in the house and not be afraid to shout it from the roof tops. They inspired us to help save other less fortunate Potbellied pigs and get them new special homes like the ones we tried to make for our kids. My Reggie girl and Pepper inspired me to become the leading zoning consultant in the US., because I didn’t want anyone coming into my home and telling me to get rid of my pigs just because some old law says” No swine allowed”. They also made us love them no matter how big they grew. There were no such thing as a so called ,”Tea Cup Pig ” back then. They were our babies no matter what. hope to find . 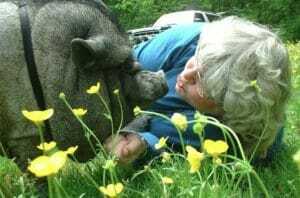 They gave us undying love and respect, acceptance, comfort, and courage to be who we are and not fear what someone would think about having a pig as a pet. I personally found that by taking my first pigs out in public all the time, not only was I not rejected by people because of society’s expectations, but my Reggie ,Pepper and I were welcomed everywhere with respect and awe for who we as a team had become and what we represented. All of us Pioneer Potbellied pig caregivers were a part of that process and I am so glad that we were and still are. Our first pigs took us places and gave us friends we would never have met had it not been for them. We love them all so much. Who would have ever thought that here we would be in our later years still embracing what was a extreme turning point in all our lives? Our first Pigs were and still are today that amazing force that drives us on to better things and deeper a love of nature and respect for all animals. We learned together to be tolerant and loving, to be patient and not so fussy about things. They taught how to live in the now. Something that people pay a lot to learn today from some glorified Guru. Just think how blessed we are to be a part of that and how wonderful it is to be able to guide new parents of their first potbellied pig in the care and expectations of a joyous life together. I would have never traded my life for anyone’s in the hay day of our first pigs. Those were the days my friends unfortunately they had to end , but they still live as motion pictures in our minds and emotions that we will always carry in our hearts for each and every one of our special first pigs who grew up together just like kids in the Hood. Rest in Peace our piggy kids as we keep your memories in our minds and the love in our hearts for all of you that had to leave us. We will always be sad but you all gave us memories that we will never forget and friends to match. When they left us they took a piece of our hearts along so they can stay connected and we will see them again someday but until that time we are here still doing what they taught us to do very well. Love and care for all animals because they are special and they need us.